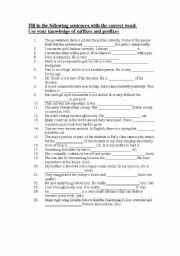 This is an interesting reading passage with comprehension questions, that deals with IQ and EQ. The main question addressed is which one actually determines success. Answer key is included. 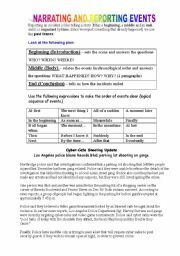 This page explains the elements of reporting an event with a sample composition. 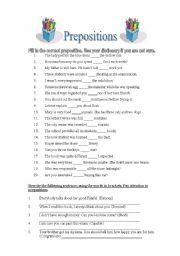 An exercise to practice the use of prepositions. 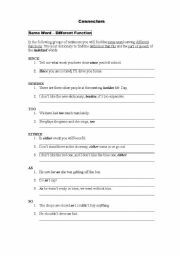 Encourage your students to use the dictioanry. Answer key is included. 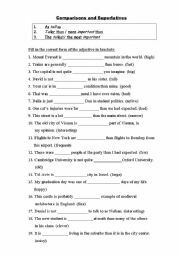 This worksheet helps the students form nouns, verbs, adjectives and adverbs with prefixes and suffixes. Answer key is included. 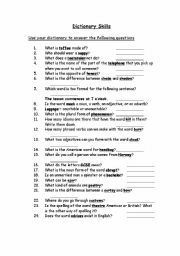 Interesting and challenging exerciese to review all tenses: present simple and progressive, past simple and progressive, future, present perfect and past perfect. This is a cute fable that shows our students how important it is to learn a second language... I usually use it at the beginning of the new when I get a new class. 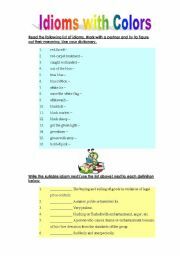 A worksheet to practice idioms with colors. 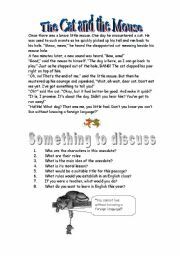 The students translate the idioms, match their meaning in English and then use them in sentences. Answer key is included.